Inside a Burmese rebel village Jump to media player The BBC visits a rebel village in Myanmar controlled by the Shan State Army North, one of the rebel groups who refused to sign a nationwide ceasefire agreement with the military. Mong La: The land where anything goes Jump to media player A strip of land on the border between China and Myanmar has existed entirely outside central government control for more than 25 years. 'Soldiers killed' in Myanmar clashes Jump to media player Nearly 50 soldiers are killed in three days of fighting between government troops and Kokang ethnic rebels in Myanmar, state media report. Landslide win for Suu Kyi's party in Myanmar Jump to media player The National League for Democracy has won a landslide victory in Myanmar's historic election, officials have said. Trams return to streets of Yangon Jump to media player The authorities in Myanmar's biggest city, Yangon, hope second-hand trams will be the solution to its growing traffic problem. The Shan State Army- North is one of the Burmese rebel groups who refused to sign a nationwide ceasefire agreement with the military last October. Rebels say they have several thousand fighters, and control a small piece of land surrounded by army positions. Late last year, they came under sustained attack. 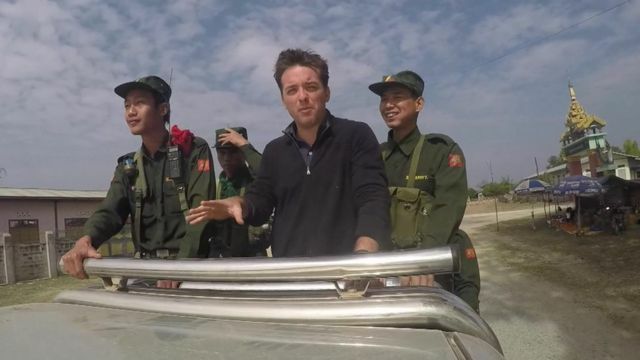 Our Myanmar correspondent Jonah Fisher managed to make it to the rebel village of Wan Hai and have a look around.